Today we recognize one of the most sacred American holidays – a day dedicated to those who paid the ultimate sacrifice for the freedoms we enjoy to this day. You and I are able to live our lives freely because of these brave men and women, and for that we will remain forever grateful. Just last week I was able to experience Memorial Day early, visiting with men and women in uniform – many of whom were from South Carolina – in Kabul, Afghanistan. During my time with them I let them know the folks from the 3rd District stand behind their mission and are praying for their safe return. I hope you will take some time today to honor the fallen and participate in a Memorial Day service. One way we honor the memory of the veterans who are no longer with us is to make sure their surviving brothers and sisters-in-arms are treated with the dignity and respect they deserve. With all the controversies surrounding the current Department of Veterans Affairs today, we are reminded we still have a long way to go to ensure those who sacrifice on our behalf are adequately treated and compensated. I promise to continue fighting to hold the VA accountable and ensure our veterans receive the benefits the were promised and deserve. I’ve heard from many veterans over the past week who have shared their frustrations with me and are disgusted with the “lack of urgency” coming from some leaders in Washington on this issue. Veterans deserve accountability, justice, and a solution, and it needs to happen immediately. Lastly, I would like to take this opportunity to invite you to join me tomorrow for my 2nd Annual First Responders Tour. 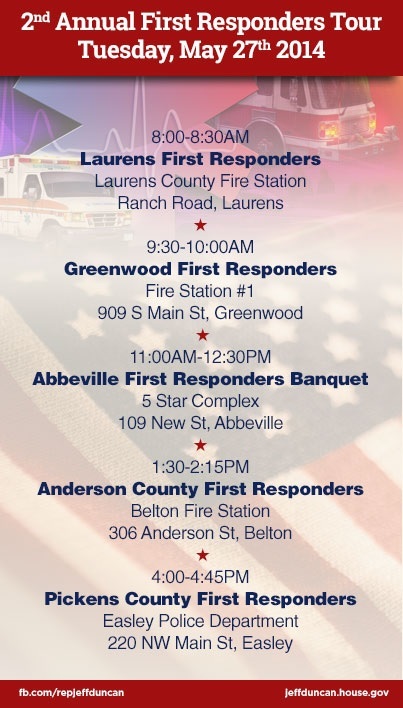 The purpose of this event is to invite the public out to honor and thank our local first responders (many of which are veterans themselves), and to pay homage to the sacrifices they make for our safety. I encourage everyone to come out and support them by attending one of these events.